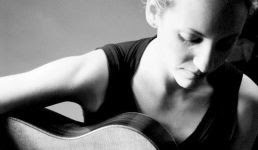 Natalia Zukerman is the daughter of famed classical musicians Pinchas and Eugenia Zukerman. She is traveling well off the classical track into confessional folk, touring with Melissa Ferrick and playing guitar with Andy Friedman and the Other Failures. She has a nice Ani-esque complexity to her guitar playing and what seems a surprising familiarity with the hills of West Virginia and country music.